On August 16 (Mon. 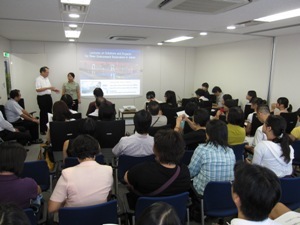 ), 2010, an inspection delegation in river and urban development (about 40 members) came to Japan from Taiwan, and had an exchange of views mainly on efforts for river environment restoration and urban development starting with the waterfront. Delegation members consisted of community action groups involved in urban development based on rivers in Taiwan, nationwide citizen’s networks, private enterprises, academic institutes, government officials, public interest corporations, etc. The purpose of their visit to Japan was to learn recent efforts for river development in Japan and the involvement of citizens.